The first major synchronicity I noticed since going pro as a tarot reader was that almost all I get is relationship/love questions. This surprised and slightly disappointed me at first. "Who am I to consult on matters of the heart?" I thought. In one quick convulsion, I felt a slight twinge of repulsion, a spike of attraction and a nauseous confusion toward the prospect. "Hey," I said, hoping the Universe would respond. I plead, "I'm an all-purpose reader. Ask me about careers and transitions, life purpose or what's coming up in the next six months. Remember, I actually love to do those "general readings" that other readers seem to dread." But, I did not get a response. Not even crickets. The answer from the cards knocked me over. They told me I was a "lightworker sent here to teach about love." And, that I needed to share the lessons my experiences of love had taught me in order to help others. The cards reminded me as they tend to do, that I was with my Twin Flame now and that our journey of discovering, recognizing, and bonding was a master class in love. The cards also brought up my early explorations of love and told me that these had prepared me for this relationship. That my relationships with family and friends, bosses and co-workers, and even with strangers had each given me a lesson in the many manifestations of love. Essentially, the cards were saying that indeed I was the right person for this job. After I thanked the cards and put them away I just sat there for awhile. Thinking. Rejecting. Contemplating. Accepting. After finally embracing this middle destiny, I immediately started to worry. "Well, if I am to be a 'love reader,' I need the perfect 'Love Deck'." I scoured Aeclectic.net and Amazon.com. "C'mon," I said out loud, "Where are you 'Perfect Love Deck'?" This was not the first time I had conducted this search. Already I had read the reviews of all the relationship-focused decks I could find. There wasn't anything newer than what I had perused. In the meantime, I kept using my "go-to gal," Ludy Lescot Tarot, for questions, Love and all. But, I was noticing an almost sort of reluctance at the beginning of my readings, once the matter had been stated. Ludy seemed less and less interested in working with me on relationship readings. The wisdom she would impart was becoming rather harsh. I'd soften her blows on the phone with my clients. Trying to translate her terse wisdom into healing and helpful words. After all, I am here to empower my clients, not make them cry. "Ludy! That's not a nice way to put it...even if it is true." I scolded. But, I got her message loud and clear. "Hurry up and find your 'Perfect Love Deck' so I don't have to deal with this stuff. Once in awhile is fine, but it's really not my gig," she was saying. I had to find it. Ludy needed a break. One day, without planning to, I happened to find myself in the vicinity of my favorite metaphysical shop, The Green Man. I went in looking to make some new crystal friends. With a sparkling handful I headed for the register. As the really cool lady who works there was ringing me up, I checked out the decks on the display behind her. I remember giggling as the lyric "looking for love in all the wrong places," played in my mind. I was looking for "love" or "relationship" in the Tarot titles. There were a few, but none that I felt attracted to. And then, glowing blue and gorgeous was The Goddess Tarot. That was it! I just knew. Who better to advise on love than the Goddesses? I took the deck home. Then I cleansed, connected and dedicated them in the name of Love. During our get-to-know-each-other time, I discovered (because I started my spring cleaning early this year) that I had over the years purchased several books about goddesses which were buried in the back room in boxes and forgotten, including one actually titled, 'Gods and Goddesses in Love'. (Lately I'm finding that the things I think I need are things I have merely forgotten I have.) So I started reading these books to learn more about the Goddesses in my deck. I'm glad I did, it's made my comprehension of the cards that much deeper. I'm reading "Summoning the Fates" right now -- I don't know how in the world I could have had this amazing book and never read it before. Finally, I decided to use the Goddess deck in a reading for a client who had a relationship question. To my delight, the cards welcomed the question and started enthusiastically chatting away, telling me Herstory and History and offered wise, loving advice on what the client could do and should expect in the situation. The reading went fabulously. I felt a rush of something warm, I felt like I was glowing. It felt.. well, it felt like love. I think the client even felt it too! Afterward, I thanked my cards profusely. That evening, while I was kicking back and browsing the web, I checked my email and discovered that I had two unexpected emails. From two different people from two different websites that I belong to. Each email was an invitation to join a special group of readers on each respective site. And both of these groups was dedicated to... what else... "Love and Relationship Readings." (Okay, Universe, I'm listening now!) I gratefully clicked "Accept" with all my heart on both. Remember Mary, there are no mistakes. Everything is just steps on the journey. Keep climbing!! How interesting this is Mary. I am just beginning to test the waters as a professional reader and I adore my Ludy Lescot deck, but she is getting a bit hard on the love questions lol. For one client I keep pulling a reversed King of Cups for her husband and was finding that so interesting and then I found your post lol. I have other decks, maybe the Divine Tarot will be kinder. 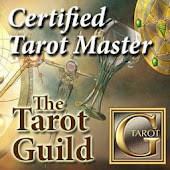 I also want to thank you and Dax for helping me become more comfortable on my path to being a professional and I have been working on my intuition.